Not sure why my co-workers don’t like eating at the employee’s cafe. I like going in for breakfast. Today I had coffee, peach yogurt, rye toast, breakfast potatoes and an omelette. 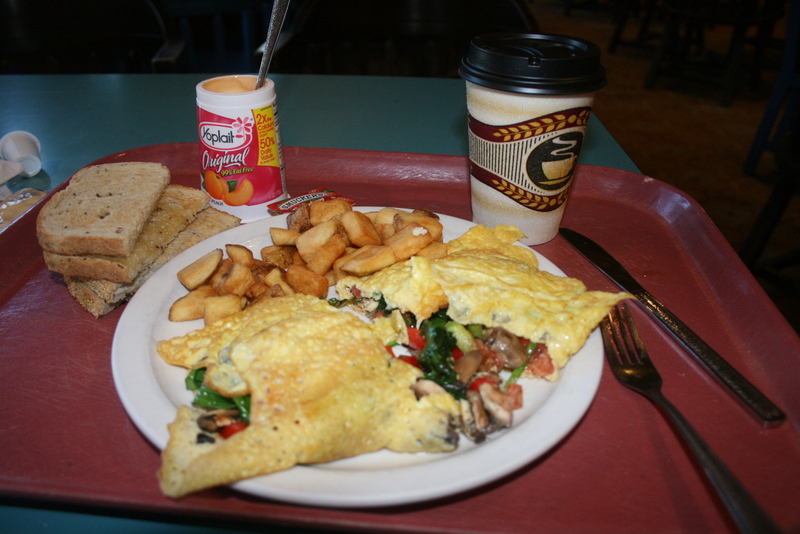 I got spinach, tomatoes, mushrooms & bell peppers inside the omelette today. I held off on the cheese for a change. Got all this for $3.66. I walked over to E-Cafe instead of taking the free shuttle too. Its not very far so it didn’t take long. Now it’s time to do some chores before I walk over for a “Guest Hospitality” class later this afternoon.